A sign of the view taken of tradition by his company; the same picture appears in the 1908 and 1920 catalogues. 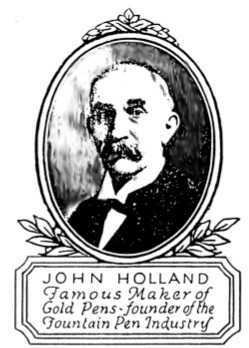 The son of a mason, John Holland was imported to the United States from Ireland in 1848 at age ten. He had apparently been educated with an eye towards a profession, but when his father died in 1854 he seems to have resigned himself to the trade to which he had already been indentured; making gold pens and their holders. The company in which he served his apprenticeship, George Sheppard Gold Pens, may have done the job too well, as he did well enough at his trade to buy the company outright by 1862, thereafter applying his own name to it. Once in control, Holland expanded the lines of production into other vaguely related items like pencils and cases. He also did a certain amount of metallurgical research, and if not responsible for iridium coming into use as a tipping for pens he certainly played a role in making it available. In buying the company he worked for, he also seems to have felt he’d bought its history, as later catalogues would refer to it being the seller of the first gold pens in the US, pointing to sales in the early 1840s; not a bad trick for pre-teen living in another country. One suspects the advertising department was not consulting with the manufacturing floor; this seems a great way to wreck a pen and a pair of trousers. The entry into fountain pen making is a little obscure. At some point in the 1880s eyedropper pens under the company’s name began to appear, but it seems they were not generally advertised until the 1890s. Self-filling pens did not appear until the start of the 20th century, when Holland introduced several variations of press-bar and indirect pressure fillers. It is interesting to note that even as late as 1920, the company still styled itself “The John Holland Gold Pen Company”, maintaining the reference to the point rather than the whole assembly, and that in 1909 they offered a catalogue of dip pens and other more 19th century parafenalia that was slightly larger than the fountain pen catalogue. Pencils and stylographs were also offered. Holland himself lived until 1917, and it appears that with his death the company began a very gentle decline. 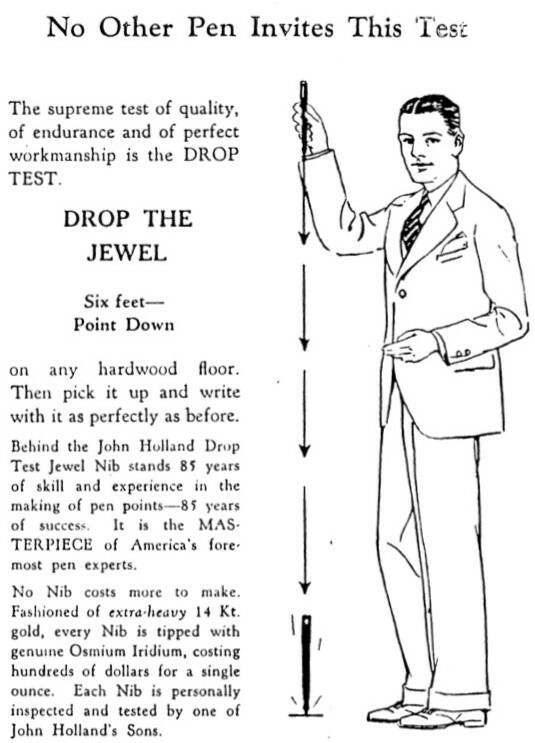 The first sign of this is the clearly insane “Drop Test” found in the company’s catalogue, suggesting that dropping the company’s premier pen from eye height, point first, onto a hardwood floor would result in no damage or reduction of writing capacity. “No other pen invites this test” went the brag, and I can’t imagine any other pen maker would be so reckless. There were also some slightly less mis-guided attempts at carving out a niche as a maker of fancy pens; offering pens with mother-of-pearl inlays, for example, which would certainly have some appeal to the upper-crust even during the Great Depression, but which were not the sort of thing to found a necessary ongoing volume of sales. National advertising appears to have more or less ceased by 1940, and the company persisted with sales of several unregarded brand-names until the final closing in the 1970s.